morning paint work: sanded all the windows then primed the last two bare windows in the living room. lunch: rice noodles sprinkled with garlic tabasco sauce. how i spent the rest of my afternoon: after some cookie dough ice cream, i lounged on the couch in the living room (underneath that grey blanket), watching television (godfather 2), surfing the web on my wireless ibook (feeling warm on my lap), then slowly drifted off to sleep. my mother called me later in the afternoon, i don't remember the conversation, i was still groggy from sleeping. when guests come over i: make my bed, wash the dishes, clear the countertop, clear the coffee table, clean the bathroom, vacuum if need be, fold my clothes (or just push it into a discreet pile on the bed), and light some candles if it happens to be a lady, which was the case tonight. oh, and put on some decent clothes (ratty pair of shorts with the broken zipper and vintage circa 1988 threadbare t-shirt with holes just won't suffice). how i spent my evening: dinner with renata! after i told her we'd just be getting chinese takeout for dinner because i was too lazy to make anything, she volunteered to bring over some ingredients so we could whip something up. renata arrived with a bag of groceries, her sneakers (in case we decided to go out for an after dinner walk, which never happened), and a parrot tulip. she basically cooked, i just helped stir and find the necessary kitchenware when the need arised. i did prepare some smoothies though. renata made a creamy pasta (add flour, add butter, add cream, called her mother to get the technique) served with sliced zucchini and tomatoes. that was the the first part of our 2 part dinner. the second part was a baked boned chicken breast mixed with bok choi with bits of crushed walnuts. at one point she used all four stovetops, every single one of my cooking pots being put into active duty along with the oven. on the stereo we had oldies music which i later replaced with duran duran then went back to the oldies. both of us were scared of the gas stovetops yet at the same time drawn to its beautiful blue flame and fast heating time. we ate in the living room, watching will & grace and some show on the travel channel about hollywood landmarks hosted by steve harvey. i introduced her to the magical world of wireless internet surfing, and then i showed her the "doll" i'd purchased yesterday. when the evening started to creep closer to her bedtime, renata left before she could fall asleep on the couch, promising me to show me her chicks this weekend. 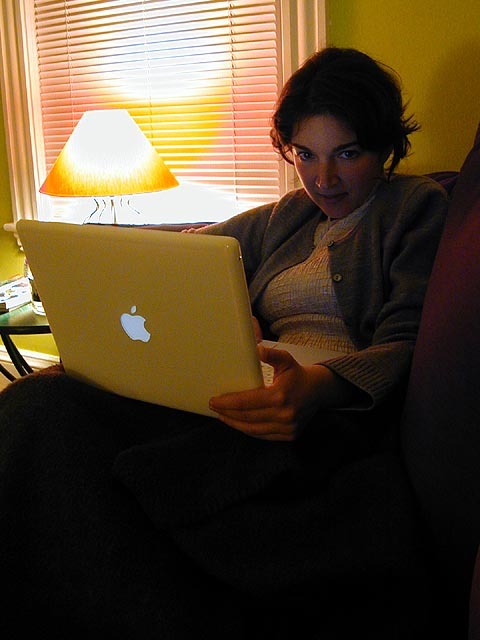 renata's complaints about the mac os: that she can't just tap the trackpad in order to click something (is this a mac OS X thing? i thought you could do this in OS 9), and the menubar items don't automatically pop down when you run the cursor over them. by evening's end, i was in a heated debate with julie via phone (got to take advantage of those unlimited weekend and night minutes) regarding whether the turtles i've been seeing are actually painted turtles or terrapins (or even sliders), and whether her own pet turtle is indeed a red-ear terrapin or something else. a pile of dirty dishes sit in the sink, i'm too lazy to go wash them. my walkway paving job looks to be cancelled tomorrow because of the imminent bad weather, so i just might go do some more painting.